As you know, Mr. Money Mustache likes to spice up his long summer vacations with occasional carpentry projects. Because of the Nagging Voices of Success, I’ve made peace with the fact that I’m at my happiest when I get to accomplish something useful at least once every week or so. So this week, I installed a new set of french doors out to the back patio at my Mom’s house here in downtown Hamilton (that’s Grandma Money Mustache to you). There was already a set of circa-1992 doors in place, but one of them had partially rotted away due to repeated water and insect exposure. Plus, both doors tended to develop fog between their glass panes in winter. When you add in the fact that this area has a rainy climate with fairly cold snowy winters, we figured it would be quite a significant upgrade to pop in a set of new steel-clad glass doors with energy-star insulation rating and low-E/Argon-filled glass panes, solving all the problems in one go. 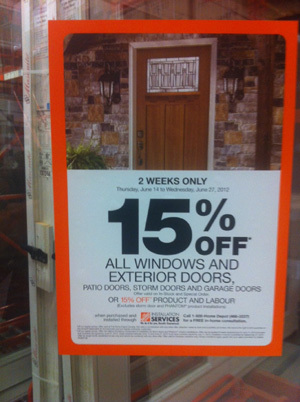 When I got to her house last week, GMM had already clipped a Home Depot coupon offering 15% off of all exterior doors. So we decided to start our shopping there. We strategically chose a Home Depot location that was close to a branch of its biggest competitor – Lowe’s. Look around to find any one-off or returned product that has what you need, then ask a store employee what sort of discount they can offer on the scratch’n’dent unit. I found the department manager and with no negotiation at all, got $100 off of the door, and he agreed to throw in a replacement rolling screen unit from the same aisle, retail price $79. So together we slid the bulky 150-pound door unit off its shelf and onto our lumber cart. With the rest of the door now visible, I inspected it carefully for damage. Everything looked great (or at least patchable) until I noticed that the specialized bottom weatherstripping was missing from one of the door panels. This was non-standard stuff and would create more than $100 of hassle to replace, so I decided to call off the deal. Normally at this point, I’d just place an order for a new-condition door with the millwork desk, but since I’m only in town for a few more days, and we had traveled over 10 miles in the construction van specifically to get an in-stock door, we decided to have another crack at finding something. Next stop: the competing Lowe’s just a mile down the road. As you can see from the picture, the whole top piece of that door’s jamb has come separated from the side piece. Plus the packaging material is gone, it’s dirty, and it looks like bad news in general. But it had an intriguing feature that really appealed to GMM – internal blinds which are sealed between the two glass panels, meaning no need to buy separate blinds, easier operation and no cleaning. The door was also a better-known brand: Jeld-wen instead of Reliabuilt. I did a quick web search on my phone and learned that this particular model of door normally sells for $629. I was now ready to find a store employee and make my pitch. Not everyone knows this, but Lowe’s and Home Depot have a policy of always honoring each other’s coupons and matching prices. Got a 15% off coupon for HD? It will work just as well at Lowe’s. Found a lower price on an identical item at Lowe’s? Take a picture and show it to HD, and see what they do. So I showed my 15% coupon for Home Depot to the department manager, and said this: “Would you be willing to sell us this damaged door on the end for $529, minus the 15% discount that HD is offering, with another $100 taken off for the damage?”. I made sure to ask the question in a buddy-buddy way rather than an entitled-customer way, adding that I would fully understand if he didn’t feel it was an appropriate deal for him. Without blinking, the guy said he would be happy to do so (I find that this happens almost every time, since these stores often have a hard time unloading damaged goods). From there, things got even better. We started sliding the door out onto the cart. The thing about French doors is that they are heavy glass and steel units attached to a thin and flimsy wooden frame. Without the packaging materials, everything flops all over the place in a very frightening way. Although GMM and I were cheerful and patient with the situation, the department manager became very apologetic upon seeing how “broken” the whole thing looked as we eased it on to the cart, and he offered additional discounts. In the end, he priced the door at $260, less than half of the regular price! On the way out, I happened to notice that both stores were offering “Professional Installation” of French doors for $650 – with a t0-be-determined additional surcharge for unusual situations such as older houses and brick construction. I mentally added that amount to our savings for the day. The funny part of all of this was that the door system was in perfect condition from my perspective. When installing big doors like this, I always start by unpackaging them and removing both doors from their hinges anyway, allowing precise leveling and screwing of the frame without the heavy doors constantly swinging around and getting in the way. So we rolled it out to the parking lot, took off the doors, pried apart the four pieces of wood that form the jamb, and laid everything into the back of my van for easy transportation. This provided additional time savings, since it normally takes some serious work (and two strong, tall people) to load a double door onto a roof rack and secure it for a long drive and then unload it at the other end. 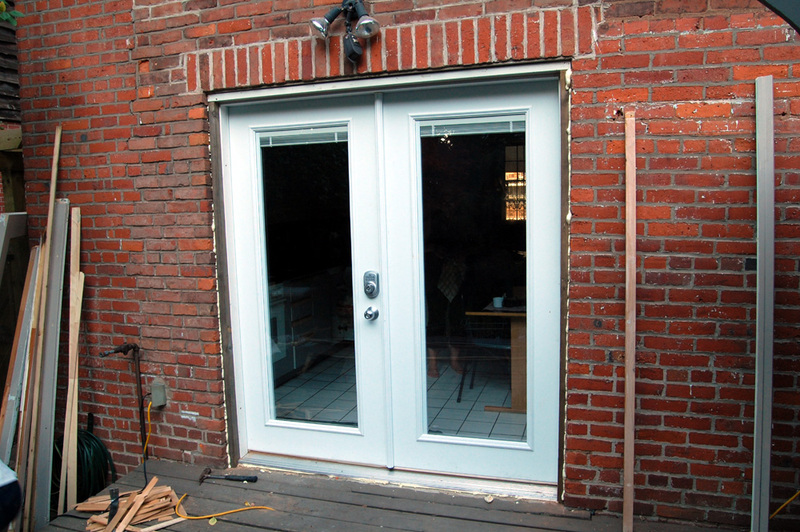 To make a long story short, I screwed the door frame together from the comfort of the back patio (10 minutes), painstakingly removed the old door system from the rough antique brick opening (1.5 hours), installed the new frame and doors and shimmed, screwed and sealed them in with spray-in foam insulation (1 hour). Then I had to create customized uneven pieces of trim both inside and out to compensate for the fact that the old brick wall was crooked in both dimensions, while doors must always be installed absolutely straight, square, and level in all directions to allow proper operation (2 hours). 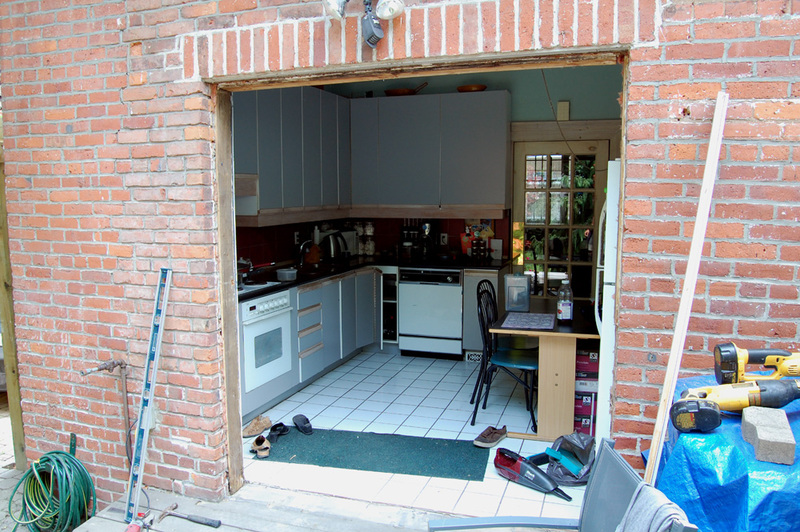 Step 1: carefully review your old door – measure the brick opening, the size of the doors, etc. Take off the interior trim and measure the frame in there. Buy a door to match the size, leaving at least 1/2″ of space on each side (most patio door sets are designed to fit within a 72″ x 80″ rough opening). Step 2: Once you have the new door sitting there ready to install, remove the old one: take old doors off their hinges, remove any remaining trim, pull out any nails, screws, and shims holding the door into its opening, and if necessary, use a saw (sawzall recommended) to cut the old jamb in several places, making it easy to pry out. Here’s the rough opening after all traces of the old door were finally cleared out. Step 3: With the new doors removed from their hinges, place the new door into the opening. For 2×4 wood construction walls, put the jamb flush with the interior drywall. For much thicker brick walls, use your imagination to decide how deeply to recess the door – you’ll be making your own trim to fill the gap anyway. Shim the bottom corners to make it perfectly level. Lock in the bottom corner with a nail or screw. Work your way up, making the hinge-side of the door frame perfectly straight and level, adding shims and sturdy screws into the wood and brick. 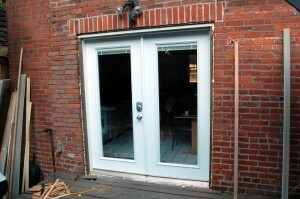 With door installation, the hinge side is everything. Then do the other hinge side. Perfectly straight and level. Now you can hang the door panels back onto their hinges, and shim and adjust the top and bottom jamb boards create a nice, uniform gap. Nail and screw everything well. Check door operation. Here’s the new door. It will look better once it is painted the more subdued brown-grey colour to match the house, but you can use your imagination for now. Finishing Up: Add insulation around the doors, figure out your own trim details inside and out, then patch, caulk, and paint as you see fit. In the end, we scored ourselves at least of $1300 of door and installation value (plus single-day installation), in exchange for just a bit of DIY and hack-the-system knowledge, and less than a day of fun work out in the fresh air for me – with a net out-of-pocket cost of $260. This is just another example of why I’m such an advocate of all homeowners learning basic renovation skills. You can specialize and justify the value of your rare brainpower all you like, but unless you have a way to make $1000 after tax in a single day of work*, it’s hard to beat the return-on-investment of a little knowhow in the area of maintaining your own house. * Actually, the equation is probably even more tilted in favor of do-it-yourself, because I have found that hiring a contractor, coordinating schedules, dealing with mistakes and mess, and other fussiness requires you to spend about 4-8 hours of your own personal time hiring out a job like this anyway. Previous Post: King for Just One Day Next Post: Early Retirement Can’t Work, Or I’d Have Heard Of It Before! Nice hack! A nice win-win too – solves a problem for the store. If you want a topic for some future video, getting a door installed level and square would be a good one – you make it sound easy, but for amateur hacks like me a door replacement usually involves a lot of planing, sanding and cussing. Well played Sir. I love to haggle with people when buying things. It used to embarass my wife, then she realized, most of the time it works! It pays to look for dings and scratches and use that as a bargaining tool. MMM – Thanks for the detail on the price discount request. It’s great for people to get the difference between haggling aggressively in places where the people they are talking with have no authority to do anything vs knowing when and where it’s appropriate and doing it respectfully. Buddy buddy vs entitled consumer makes so much difference! One can also buy a prepaid gift card at an exchange site such as plasticjungle or cardpool and get an additional 7-10ish percent off. Wondering if anyone has tried to score a discount on a multi-pack of something where one or more of the items is missing? Obviously you would ask for a bigger discount than the equivalent value of the missing items. Great. I have done several windows and single doors but never a double mostly because I haven’t had to and partly because of the need to have two people move it around. The first time I did each I was amazed at how simple it is – don’t get me wrong, I had to fuss with the door a bit to get it right so it took a bit longer than a pro but the next one was even easier. My neighbor had to do his door and I was telling him it was fairly simple and offered to help if he wanted, he preferred to pay someone (I think $1100). Funny thing is I think it took me less time to do mine than the pros took to do his. You are also spot on about time to deal with contractors. That is the main reason I started doing DIY, sure the savings are great but I found that whenever I was willing to pay somebody the time invested to source, bid, hire, and monitor was a signifcant amount of time that wasn’t that far off from doing it myself and many times there would still be mistakes. Great job and it looks beautiful! But most importantly, was GMM thrilled with her door? Can’t lie; I’m feeling seriously jealous of your handyman skills. You’ve convinced me to help my very handy friend with projects on his house, so that I can learn some stuff. I will also look into Habitat for Humanity in my area. Ooh, great tips! We are going to need to replace our back door eventually, and this will come in handy. And right now, my husband is building up our hall closet. It was a “cubby” with a very-badly installed “arch” – in 1976, I guess someone really wanted our 1947 house to look like it was built in the 20’s. Anyway, he’s been busy removing an old pipe that was part of the old underhouse heating system, taking out the arch, framing the door, drywalling the interior and exterior, installing electrical and lighting (he’s going to put our WiFi/computer stuff on a shelf in there). Once the shelves are up: gonna have to buy and hang the doors. This will help us negotiate to find the bifold doors. Funny, I tried and failed at getting a discount at BJ’s today. I was purchasing a frozen turkey and saw that it had expired at the register – by 3 days. As ‘sell-by’ dates don’t mean much in frozen foods, I called the sales person who got a manager. I tried to give him an opportunity to offer it to me at a discount, but he didn’t. I’m sure he just took it and threw it away after I was gone . . . I had something like that happen at Safeway and the manager finally said that if something is sold after the sell-by date and someone gets ill that the liability is too great for them. It is cheaper to just throw it away. He then said, “I am going to go out back right now and throw this away in the box by the door.” Sure, enough, five mintues later, the turkey was waiting for me in a box by the back door—free. I was thrilled, to say the least! Brilliant – this is my favourite discount story! How timely; we just had our balcony door replaced this weekend, since we own a home built before anything was standardized I pretty much have to contract out everything the first time around. I used one of the most competent contractors I have ever met and one that I have used before. It took him 8 hours to replace the door he didn’t mess around a bit. The sill had been roofed over 4 sheets thick, it had a non-standard rough opening, plus lathing and plaster walls on the inside and was in the sun on a 100 degree day; I am better off leaving that mess to the pros. Pretty much how I replaced the mammoth (floor to ceiling, 11′ wide) single paned picture window in my living room. (Sans the haggling, which I dislike.) Found a customer returned window of about the size I wanted (about 8’x5′) with some minor cosmetic blemishes at HD (though I checked Lowe’s too, HD just had the best one), framed in the opening to the new size, and there I was – not to mention the 6 or 12 months of free interest on the HD card. And the original window? It’s now the sun-facing side of my neighbors’ greenhouse. Yeah, I’m not really into actual haggling (which I’d define as going back and forth with multiple prices). But I do like figuring out on a reasonable price in my own mind and presenting it without pressure to a seller. Without the pressure and mind games of true price negotiation, people seem to feel like it’s much more of a win/win situation and the deals go well. I love to haggle. I think it has something to do with when I was young my Dad would take me to the flea market. I learned to haggle over silly things, like toys. And later I would haggle of bigger purchases too. I lived in Turkey for awhile and they haggle over everything. The price they tell you first is the “American price” if you pay it, they think you are stupid. I never paid it. I actually earned respect from some of the Turkish people there. I met a few ladies who took me under their wing and showed me all the best places there. I miss that sometimes. I think it’s just a culture thing really. Most Americans think that people are insulting them when they are haggling, but a lot of cultures if you don’t haggle then it’s assumed that you are stupid or lazy. They were all either ding or dented or previous customer returns. We got the Fridge for 60% off, we got the stove 40% off and they were discountinuing the microwave over the stove but were out of stock. So my wife asked what they could do. They sold us the new model at the close out price because they felt bad. We would just go one week and wait a week or two and go back and if it was still there my wife would say “this has been sitting here a while, would you discount it another $200 ror $300?” It took a couple months but it was worth the savings and we were in the midst of renovating our house anyways so it wasn’t a big sacrifice. My best home depot / lowes score was my front door! We had been putting off replacing it for ~2 years due to the high cost of a front door with 2 sidelights, and my sidelights were a less common size, meaning special order.. Long story short, I notice an odd sized door in the store and mention to my wife it looks like the 10″ instead fo 12″ sideligjts.. I was sitting there at half price already.. the sales associate heard me and said, If you buy it now I will give it to you for $350. thankyou 1k discount for procrastination ! Had a similar discount happen for a custom order sized window, 94×57 rough opening. First time I got a price quote it was way out of line with the off the shelf window pricing. 2 years later, looking for a way to use multiple offf the sheelf windows to fill the gap, an associate quotes me a price about half of what it was the first time.. He adjusted the width by 1/4″ so it was a standard size and it cut the price in half… and mentioned that the previous quote must have been from someone who had no clue what they were doing. Great deal. You never know what you can get unless you ask for it. I will have to try this out next time I am at home depot or Lowes. I recently wrote about how I got at&t to give me a free $150 smartphone on my blog. Speaking of learning basic remodel skills, any tips on how to obtain these? Community courses? Websites? PBS shows? I’m slowly building my weekend warrior chops, but at this point still a novice. I suppose that’s why many of these trades are taught through internships rather than a classroom setting. Ahh, yes, good point! Thank you! The shed I am going to build is probably going to get me a new compressor and framing nailer. This post reminds me that I so need to work on my man skills. Just curious, are these actually considered French doors? All the french doors I’ve seen were paneled glass, not one big piece. I even looked up the definition and each one mentioned panels. A French door is just a door with glass the whole length. These are single pane, but you can get a lot of different styles of pane. You’re probably most used to seeing the 9-pane, or “9-lite” style. Usually your choice in this kind of doorway is a French door or a slider, or a single door with side lights. Hitting up yard sales over the years has given me the inclination to try for a discount on just about everything. The other day I was in the grocery store and saw a produce manager removing heads of cauliflower from the display. I asked if he planned to discount them and he marked them right down to about 15% of the regular price. Even my kids know to do it – I start them young -. I think the main key is to always be very friendly, like you are just asking a favor with no expectancy. Excellent job on those doors! Funnily enough, I am getting new French doors put in in a couple of weeks time. Unfortunately the opening is custom sized and the doors have to be custom made to order, meaning little room for haggling. I second the question about how to get started/learn. I am ready to get my hands dirty, but a little gun shy for fear of messing a project up. From reading this blog enough, I believe that part of the journey to FI (financial independence) through the mustachian way to is challenge yourself and pushing past your old comfort zones. What an awesome deal! We definitely under-utilize the power of bargaining in America. It’s incredible because almost every other country does it besides us! I will definitely try to use that coupon idea the next time I need to buy something at a store that has competitors. 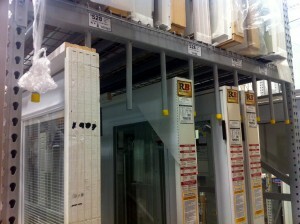 Wow, I got several quotes of $5000 in Edwards to install two French doors. The house was built with them but the previous owner pulled them out and closed up the space. The Home Depot in my town has a Harbor Freight across the street and I’ve found that they (HD) will accept the HF 20% off coupons on any tools that HF sells a similar model of. And both within easy biking distance of my home :) I’ve actually had people ask if I work at HD. My house is located 1 mile from Home Depot, with a Lowe’s literally right next to it. Harbor freight is 2.5 miles from my house in the other direction. I’ve gotten many loads of material in my bike trailer, and even got everything for my attic insulation in a small rental car (pre-bike trailer days). The U-Haul van rental was also within 3 miles, so same day rental was pretty cheap and less expensive than maintaining my own van/truck for the once a year a may need one. Unfortunately I didn’t find this article to bolster my resolve to install my own french doors early enough. We spent $1200 and 3 months with the contractor, who took a week to install it. Granted it was a bit more complicated, including complete removal of the siding, 3″ of material from the wall because I didn’t buy the right size door, and an extra expense of buying a new window because the old door has one built in. I learned a lot in the experience by helping out, but wish I would have just done it myself. Expensive lesson. I keep thinking that for the $1200 I could have bought the tools which I didn’t have that were needed for this job. Oh well, the patio looks so much better now. Awsome site, just found it today! I wanted to add another home improvement tip for you. It is amazing how much a little paint can add to the beauty of a home, and also add the value of protection of elements. Miss tint paint is my new thing!. My parents have a 2500 square foot home and a detached 2 car garage. I was able to find 10 gallons of off white high quality exterior paint for 2 bucks a gallon. Mom was instant on sunny yellow with white trim so i bought 1 gallon of the same quality of yellow paint to mix in a shade that she liked at a cost of 60 bucks. it would have cost us several hundred dollars to paint but we are painting their house for less than $100. the cost of grilling hotdogs and chicken (they raise their own) was also a minimal expense for labor. we invited the youth group from their church to come and help paint and we were able to complete the whole thing in a weekend, including 2 coats of paint! it is important to note that walmart home depot ect only discount misstints about 50% but ben Moore ect… charge roughly 2-5$ per gallon. You may have to mix a few colors to have enough but I have been able to redecorate my own home and just a whim with misstints! I have done this too. Last year we wanted to paint our bedroom something other than the whitish color. We went to Home Depot and looked at the mis-tinted paints and there were two light green ones there that we bought and mixed together. I call it my ‘green tea bedroom’ it’s more like a dark minty green. We love it and it was $12 for both gallons. That’s less than one gallon is normally! SCORE!! did you notice that the older door had a lot more window space? did anyone in your fam think this was a negative? I certainly would have considered into my equation, although i would not have necessarily have come to different conclusions than you. I know I’m late to this party, but I’d like to make a few comments too! I can’t say enough about attitude when asking for a discount. Act like an entitled jerk, and suddenly no one has authority to change the price. Be polite. Use appropriate grammer. Say please and thank you. Possible most importantly, once they say Ok, shut the hell up! You’ve already got what you want. Any more talking about it can only irritate them, alienate them or make them regret the decision, making it harder for you next time. Also, keep your voice down. Most managers just want to get through their day and go home. If you’re noisy, everyone in the store may suddenly become mustachian without our politeness. They won’t be impressed – and they may remember you next week when you’re asking for another discount. Some of you are also saying you’re scared to fix something – you may mess it up. If it needs fixing, it’s already messed up! For larger projects (electrical, plumbing, exterior doors, etc) if you do it at the beginning of time off (like a vacation) you still have time to get a professional to come fix it for you if you can’t pull it off, and unless you’re removing load bearing walls, it’s unlikely you’ll do any serious damage. So worst case scenario, you gained valuable experience and had to pay the pro you were going to pay anyhow. Lastly, for experience – anytime you pay someone to do something for you, watch what they do, and ask questions. Boom. Now you have some experience. Now my hardwood floors are in need of refinish! Long story short, I notice an odd sized door in the store and mention to my Girlfriend it looks like the 10″ instead of 12″ sidelights.. I was sitting there at half price already.. the sales associate heard me and said, If you buy it now I will give it to you for $350. thank you discount for procrastination ! but still best deal great going. Awesome advice. I didn’t know that Lowes would honor Home Depots coupons. We don’t have a Lowes that’s close to us, but still. 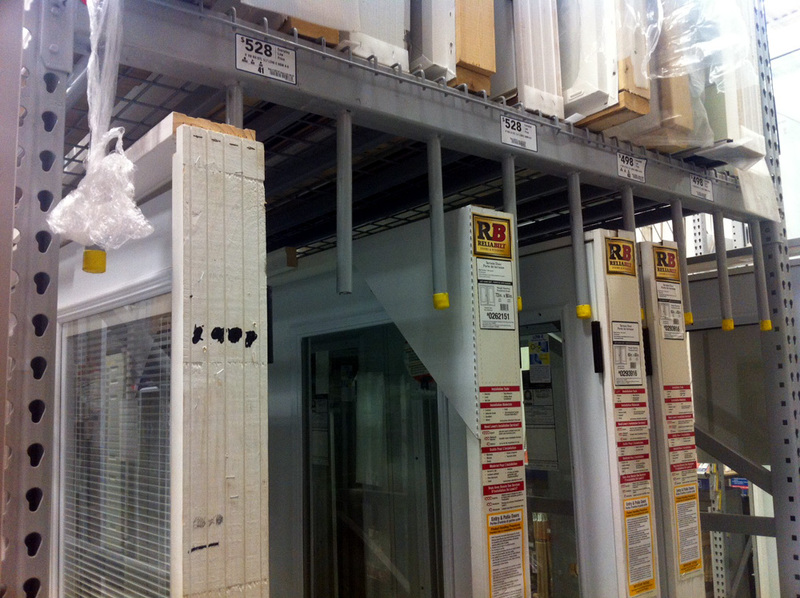 We usually try to find what we need at a habitat restore. Used stuff for WAY cheaper. They are in most major cities now too. Ours is about 30 minutes away, so we only go when we have other business in town. Also, you never know what you are going to find there. Speaking of which I should probably go and get some doors for my basement soon. All I need now is to learn how to put up ventilation systems in the basement (not that we use it that often) and then finish getting the drywall up. We bought this house for a deal because it wasn’t “finished”. We thought it would be a great way to customize our house. These savings can be upped even more! Take your cash back credit card and go onto one of the very reliable websites that sells printable gift cards at a discount. Your cash back can vary, depending on the credit card, and then if you shop the gift card websites against each other (giftcardgranny will do a comparison of prices for you), you can get the best deal. I’ve also bought gift cards on e-bay from private sellers, who usually have a harder time unloading large value gift cards, and when you pay with your credit card you will have buyer protection. If you are a frequent shopper at any particular store, it benefits you to buy the gift cards in advance, when they go on sale. I have very frequently gotten Home Depot, Lowe’s or Whole Foods at 10-15% off, and then saved them for the future, when they have something on sale or there are damaged goods, plus I have a coupon, plus the gift card savings, plus the cash back saving. If you can develop a ‘stash of discounts you buy at big discounts, you can do most of your shopping that way. The only thing I have found that you lose is the ability to do a Visa/MC dispute if needed, because the credit card was used for the gift card and not the product.